‘Two or Three Things I Know About Provo’ is an exhibition that we curated, designed and installed ourselves, while we were responsible for all the research, texts and translations as well. The subject of this exhibition was the Provo movement, including some of its post-Provo manifestations. As we’re writing this, two editions of ‘Two or Three Things I Know About Provo’ have been held (so far). The first one took place in Amsterdam, between February 18 and March 13, 2011, while a second, more extended version took place in Brno, between June 22 and October 28, 2012. In the text below we discuss the first version of the exhibition – the one that took place in 2011. Our exhibition should be regarded as an incomplete archive, one that is intentionally subjective and biased. Moreover, it represents a view that’s very personal – after all, Marieke Stolk [one of the three members of Experimental Jetset] is Rob Stolk’s oldest daughter. By sketching of portrait of Rob Stolk (as printer, as designer, as activist, as organizer, as publisher), we tried to explore the notion of ‘the printer as auteur’, the relationship between activism and archivism, and the connection between the city and the printing press. As we already wrote, the first edition of ‘Two or Three Things I Know About Provo’ took place in Amsterdam, between February 18 and March 13, 2011. But the story actually started much earlier, in December of that previous year, when Tim Voss approached us with some questions about Provo. 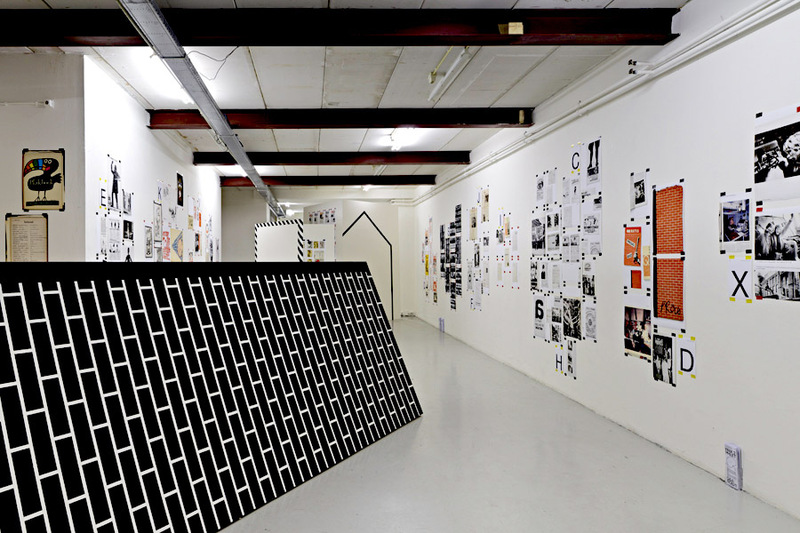 Around that time, Tim was just appointed as director of Amsterdam exhibition space W139, and being German, he felt obliged to delve a bit into Dutch culture in general, and the history of Amsterdam in particular. As it happens, W139 is an art space with deep roots in the Amsterdam squatters’ scene – and as Tim quickly found out, this squat scene originated for a large part in the Provo movement. Apparently, one of the staff told Tim about the fact that Marieke is the oldest daughter of Rob Stolk, one of the main founders of the Provo movement. So in the winter of 2010, Tim mailed us if he could drop by at our studio, just to ask us some questions about Provo and related matters. Before we knew it, we agreed to curate and design an exhibition on the subject of Provo, the opening scheduled to take place in February, 2011. Tim’s agenda, for asking us to stage such an exhibition in W139, cannot be seen apart from the recent political climate in the Netherlands around that time. In a nutshell, between October 2010 and April 2012, the Dutch were governed by a right-wing coalition who seemed determined to dismantle the country’s cultural sector by all means necessary – part of a larger national backlash against everything that was seen as too ‘left-wing’ or ‘elitist’. While disproportionate budget cuts were used as an instrument to tear down the infrastructure of established cultural institutes, repressive laws were introduced as a way to demolish the underlying structure of more subcultural, ‘grass-roots’ initiatives. One of these repressive laws was the ban on squatting, a clear attempt to restrict the fertile role that squatting traditionally has always played within the Dutch cultural landscape. In our view, Tim’s decision to accommodate, within the walls of W139, a presentation on the history of Provo, should certainly be seen as a clear statement against this current right-wing climate. Our own motivation (to accept Tim’s invitation) was somewhat more complicated. We were actually quite reluctant to do something on the subject of Provo. Since the father of Marieke plays such an important role in the story of Provo, we always thought of the subject as being somehow too emotional, and certainly too personal. Added to that, Rob Stolk was actually one of the driving forces behind the liquidation of Provo – and after the shutdown, he never looked back. So why should we be the ones looking back? One of the reasons why we decided to accept Tim’s invitation was simply the fact that we thought Tim’s agenda, to re-invoke the spirit of resistance in Amsterdam, was a very important one. The other reason was of a much more sentimental nature: in the period that the exhibition would take place, Rob would have celebrated his 65th birthday – while the same period also marked the 10th anniversary of Rob’s untimely death in 2001. And thus, we decided to turn this exhibition in a homage to Rob – and to transform our personal and emotional attachment to the subject into a positive rather than a negative factor. We already owned a large collection of Provo-related material (material we mostly acquired ourselves, throughout the years). With the exhibition coming up, we collected even more material. But instead of exhibiting the original material, we decided to photograph the material, turn these photographs into large prints, and exhibit these prints. There were a couple of reasons why we decided to exhibit the reproduced material, instead of the original material (a decision that’s actually quite atypical for us, as we usually prefer original material). The main reason is quite basic. 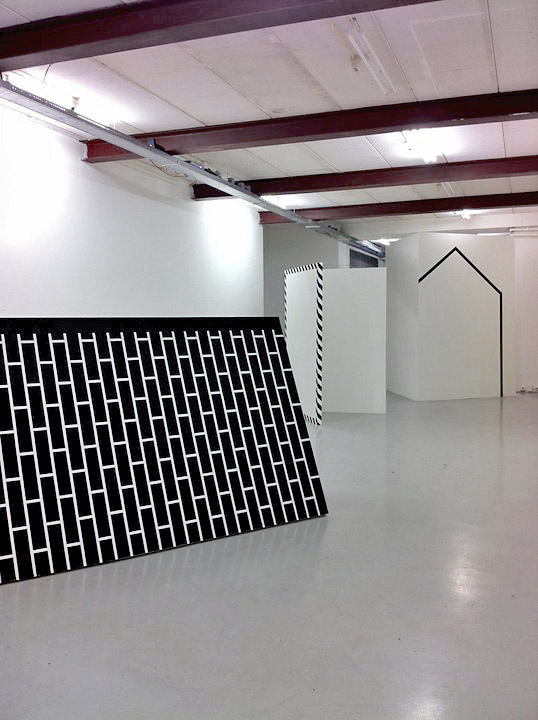 The exhibition in W139 was extremely low-budget, and there were no frames or display cases at our disposal. At the same time, the Provo material itself was quite valuable – not only financially, but also emotionally. So displaying the reproductions, instead of the original material, was initially a pragmatic solution. However, the moment we started to photograph the original material, we noticed the act of reproduction also added a certain perspective to the material. The way we photographed the printed matter, the prints almost became still-lives, or maybe even portraits. Capturing every wrinkle in the paper, the act of photographing became an important part of the exhibition itself. We produced the colourprints ourselves, on our own inkjet-printer, in two sizes (A3 and A2). We then organized the prints thematically, and divided them into 26 groups, which we ‘numbered’ A to Z (using black & white A4-sized prints, produced on our laser-printer). 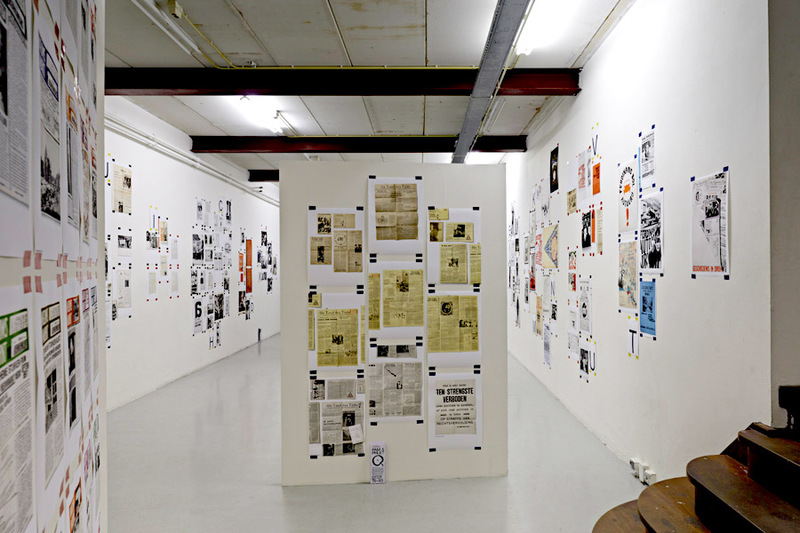 We taped these 26 groups to the walls, as separate clusters, using coloured gaffer tape: black tape for prints related to Provo (1965–1967), red tape indicating the period between 1967 and 1976 (focusing mainly on Aktiegroep Nieuwmarkt), and blue tape referring to the period between 1976 and 1983 (the period during which 'De Tand des Tijds’ was published). Yellow tape was used for general prints. One of the prints in the exhibition actually contained a key (‘legenda’) to this colour code. For each of the 26 groups, we wrote a short text, explaining the theme. These 26 descriptions were compiled in a mimeographed pamphlet (basically an A3-sized sheet, printed on both sides, and folded into a slim 105 x 297 cm brochure). This pamphlet was actually only one of a series of nine pamphlets, which we produced especially for the occasion. These pamphlets were available for free in the exhibition, and meant to be read while walking through the space. The pamphlets contained descriptions, old texts, new texts, interviews and background information, all in English. 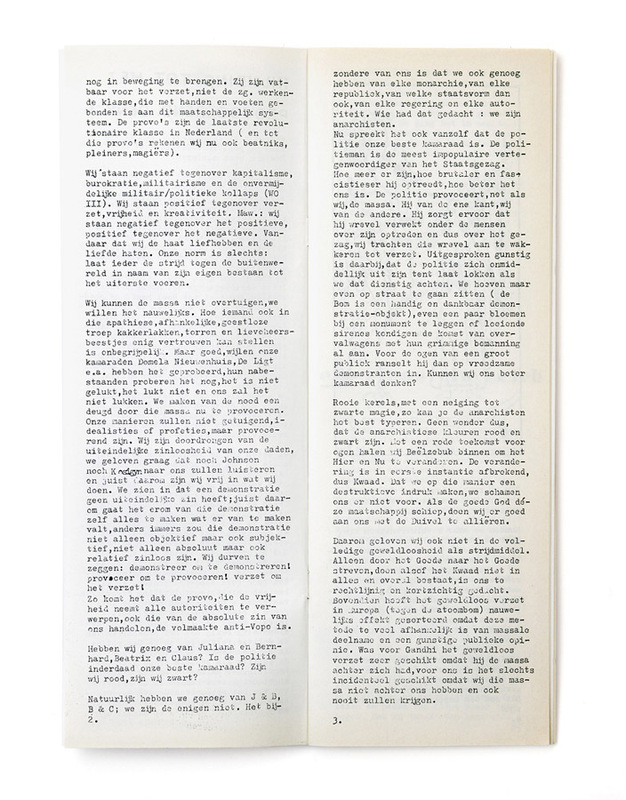 The first pamphlet featured the main introductory text (written by us), the second pamphlet contained the 26 descriptions of the themes (written by us), the third pamphlet consisted of a reprinted and translated interview with Rob Stolk from 1991 (written by Tjebbe van Tijen, originally published in 1991 in the magazine ‘Jeugd en Samenleving’), the fourth pamphlet carried a recent interview with Sara Stolk-Duys (written by Anna Leeflang, on the occasion of the exhibition), the fifth pamphlet included two old interviews (from 1984 and 2001, again with Rob Stolk), the sixth pamphlet chronicles the complete history of 'De Tand des Tijds’ (as remembered by Ad Leeflang), while the seventh pamphlet contained a complete list of Provo-material currently available in the archives of the International Institute of Social History (IISG). The eight and ninth pamphlet – we will get to that later. 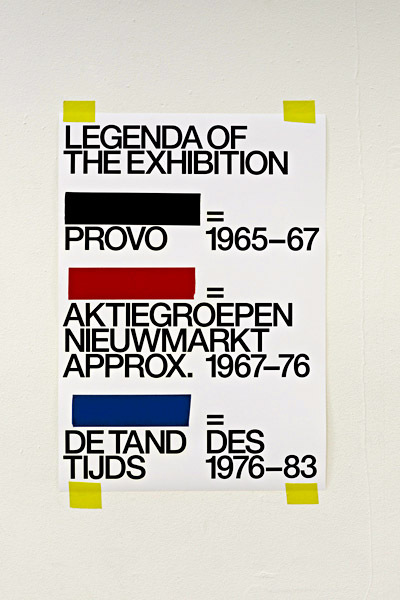 The pamphlets were mimeographed (by Extrapool, Nijmegen) in colours that again referred to the themes: the pamphlets printed in black referred mainly to Provo, the red one referred to the period 1967–1976, while the one printed in blue focused on the period between 1976 and 1983. Stacks of pamphlets were placed at certain points in the exhibition, for visitors to take away – but the pamphlets were also available as complete sets (held together with a brick-patterned piece of paper), behind the reception desk. We are currently in the process of re-editing and correcting these pamphlets; in the near future, we might put the contents of these pamphlets online. A very important part of the exhibition were the three wooden constructions, that functioned as a way to emphasize one of the main themes of the exhibition: the relationship between printed matter and the city. 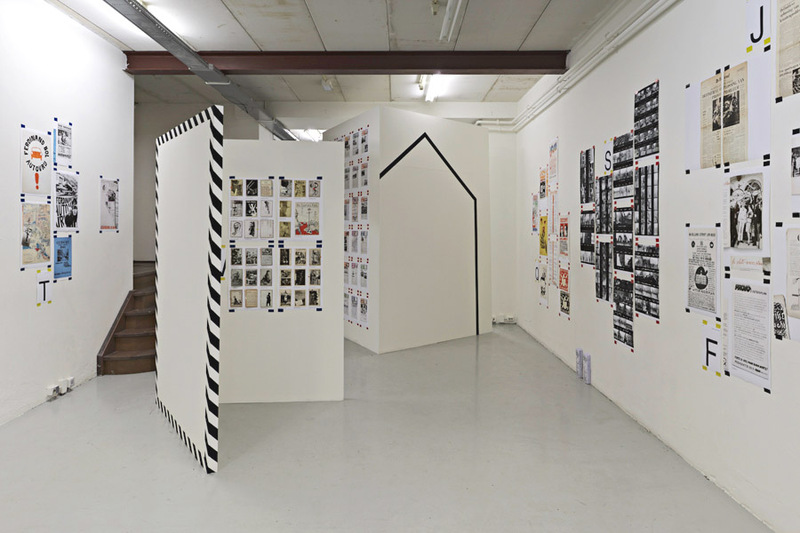 By ‘blowing up’ three motives which we saw as iconic for the three periods we wanted to describe (1965–1967, 1967–1976, 1976–1983), we literally tried to turn printed matter into a city – an abstracted city, consisting of a wall (referring to the first few issues of Provo), a building (referring to the ‘outlined house’ murals, which we came across in various publications from that period) and a billboard (based on the airmail-striped lay-out of ‘De Tand des Tijds’). Another essential part of the exhibition was the reprint of the first issue of Provo. In 1965, the first issue of Provo was printed in an edition of 500. Of that print run, 400 copies were immediately confiscated by the police. 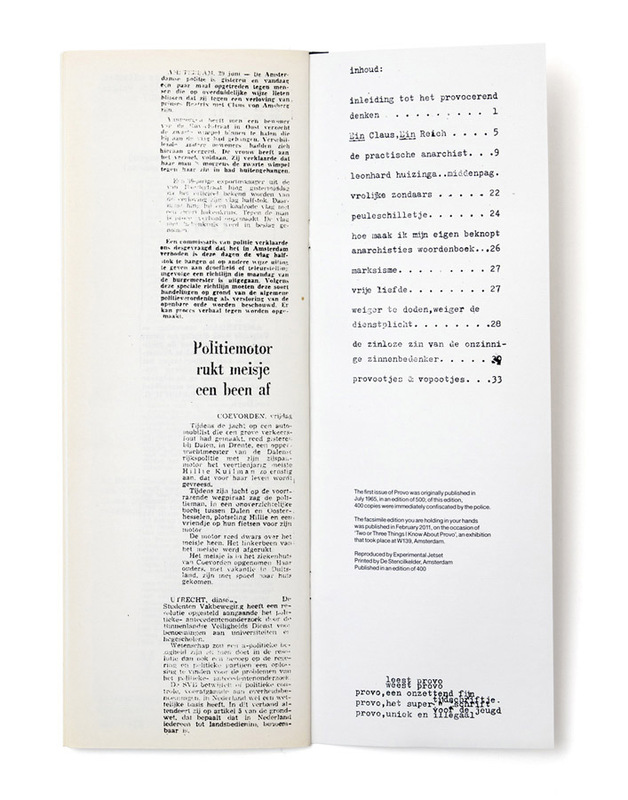 In order to “right this historical wrong” (so to speak), we decided to published a facsimile edition of 400, mimeographed by De Stencilkelder, and hand-folded, -stapled, and -taped by ourselves. These copies were for sale during the duration of the exhibition, for 3 euros each (basically, the cost-price). The opening of the exhibition took place on February 17, 2011, and included a short speech by the writer Jan Donkers. The day after, February 18, we did a short lecture ourselves (a “tour through the gallery”, so to speak). On February 28, we presented a special program at Red Light Radio, an Amsterdam online ‘pirate’ station (situated in the Red Light District, near W139). The radio-show consisted mainly of a one-hour sound collage, compiled and mixed by ourselves, broadcasted live. An accompanying text sheet (containing the track-list, and descriptions of the fragments) was available for downloading during the broadcast. This text sheet was later actually included in our series of mimeographed pamphlets. The radio-show is archived here (update: here). On March 10 (a date known in Provo circles as the ‘Day of Anarchy’), we presented a short film festival in W139, featuring movies related to Provo and post-Provo. The program included a ‘medley’ of vintage Provo footage, a never-completed documentary about the early squat scene (circa 1968) in Amsterdam, a short item on the ‘Maagdenhuisbezetting’ (the occupation of the University of Amsterdam, which took place in 1969), and a more recent TV-documentary on the subject of the Aktiegroep Nieuwmarkt. For the film festival, we produced a sheet containing short descriptions (and credits) of all the shown movies. This sheet was later included in the series of mimeographed pamphlets. 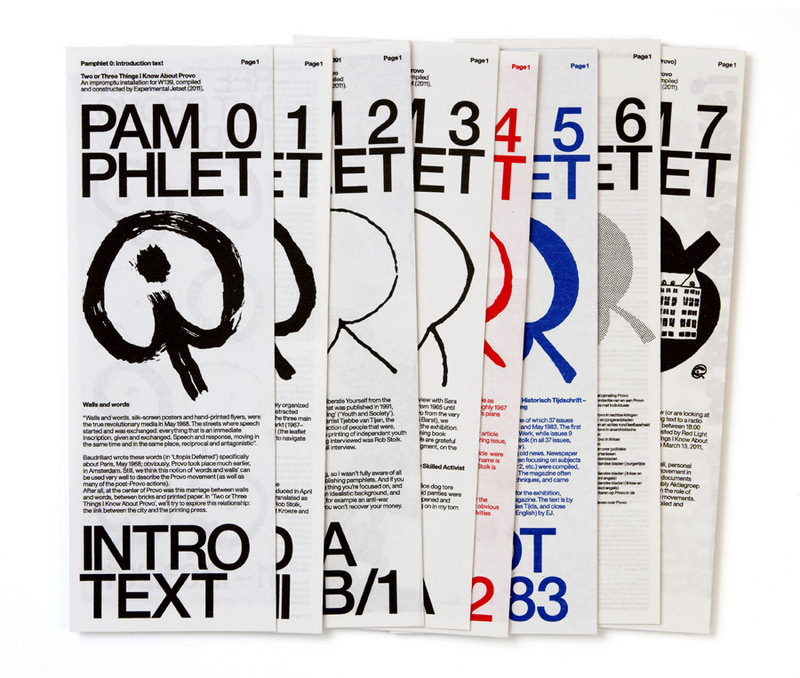 The film program also included an unannounced talk by Auke Boersma (a transcript of his lecture was later included in the catalogue we designed in 2012, for the Brno edition of the exhibition). A photo taken during this talk can be found here. Shown above a photo of the invitation we designed for the exhibition, front and back. This invitation was basically a double-sided, A6-sized postcard (offset-printed by De Raddraaier, Amsterdam). It was actually printed in two variations – on the first version, the text on the back included the date of the opening, while the second version featured only the general information about the exhibition (for use after the opening). 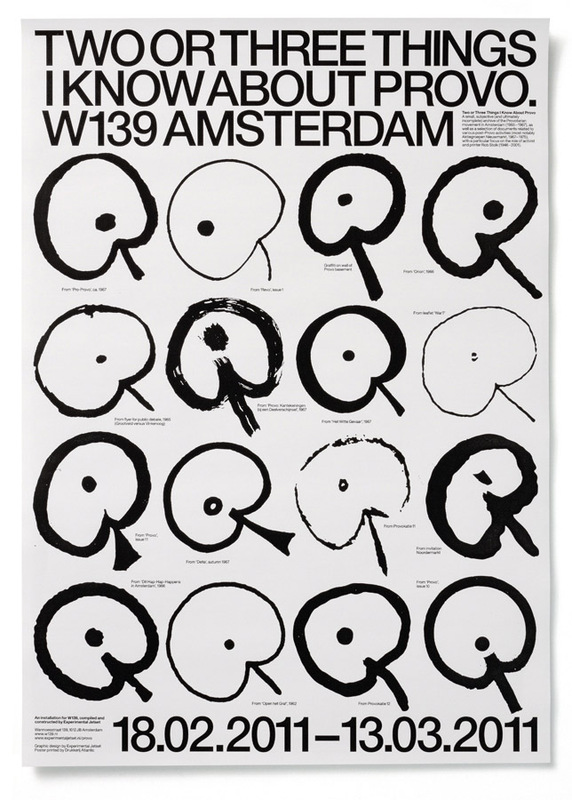 Shown below the A2-sized poster we designed for the exhibition (offset-printed by Drukkerij Atlantic, Amsterdam). 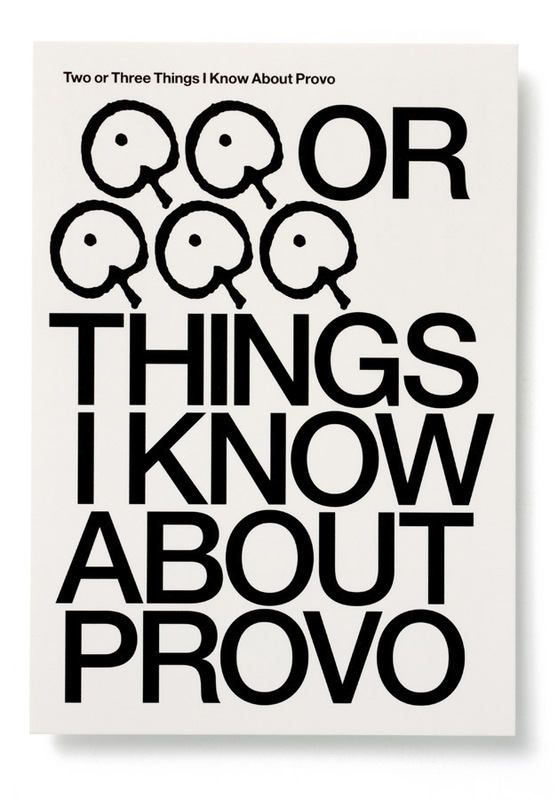 What we tried to express, through this poster, was the idea that there are many versions of Provo. So by displaying a typology of different variations on the ‘Gnot Apple’ (the unofficial ‘logo’ of Provo, originally conceived in 1962 by Robert Jasper Grootveld and Bart Hughes as a symbol of Amsterdam as ‘Magick Centre’), scanned from different sources, we tried to demonstrate that there exist many different possible interpretations of the history of Provo. 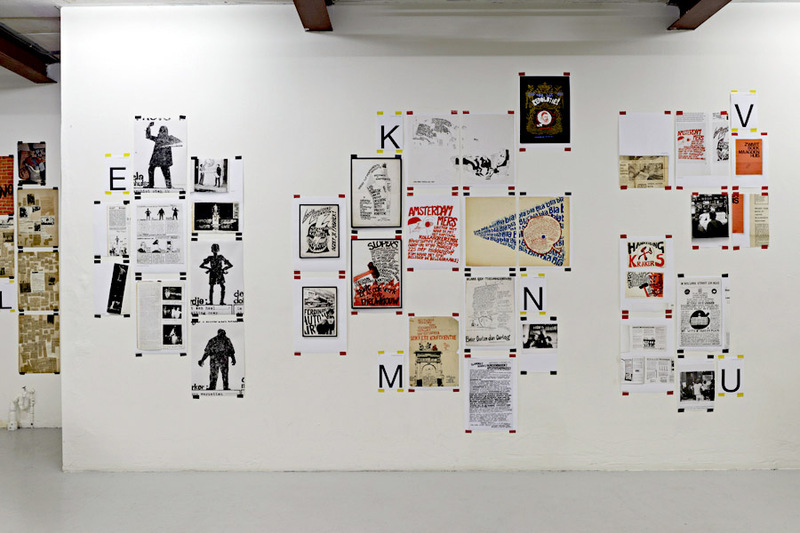 What we also liked was the idea of the poster as a collection, or rather an archive in itself, emphasizing (or rather, echoing) the fact that the exhibition should be seen as an archive as well. (Since the exhibition revolved around the practice of printing, it’s interesting to note that we employed a different printing company for each piece of printed matter. 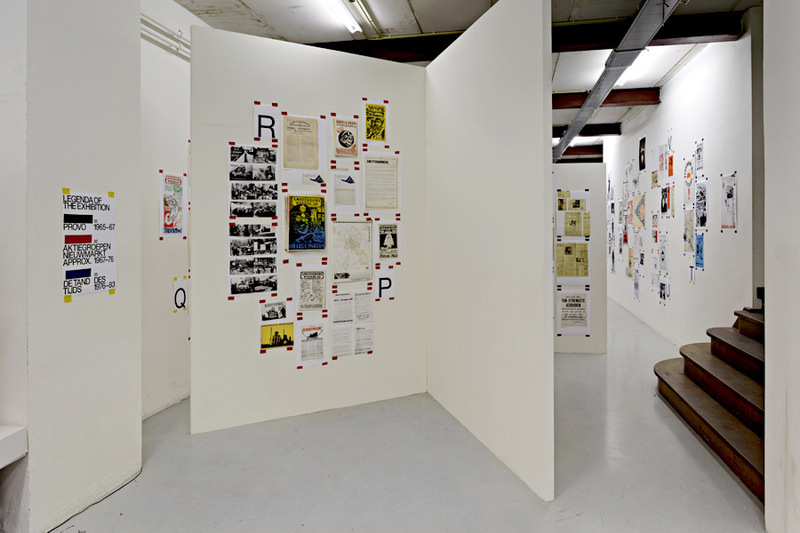 The pamphlets were mimeographed at Extrapool/Knust, the Provo facsimile was mimeographed at De Stencilkelder, the postcard was offset-printed at de Raddraaier, and the A2 poster was offset-printed at Drukkerij Atlantic. All the prints in the exhibition were produced by ourselves, on our own laser-printer). All the above pictures of the exhibition (the ‘installation views’, so to speak) were either photographed by ourselves, or by Johannes Schwartz. We later used Johannes photographs in the catalogue that was published on the occasion of the second edition of ‘Two or Three Things’; the one that took place in Brno, in 2012. Another interesting set of photos was made by Maaike Lauwaert, and can be found on Flickr. 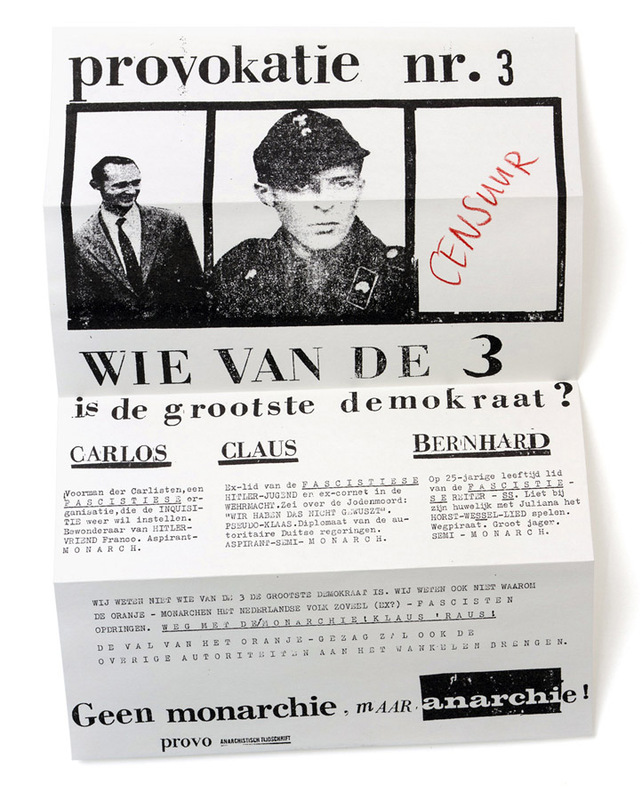 People who want to learn more about the history of Provo should definitely check out Richard Kempton’s ‘Provo: Amsterdam’s Anarchist Revolt’ (published in 2007 by Autonomedia), and ‘Imaazje: De Verbeelding van Provo, 1965–67’ by Niek Pas (published in 2003 by Wereldbibliotheek).